Get some mates over, share some sake and have a sushi party. Rinse the rice very well under cold water. Drain thoroughly and put into a large saucepan that has a lid. Pour over 1 pint of water. Bring to the boil and allow to simmer for about 25 minutes or until nearly all the water has been absorbed. Remove from the heat, cover with a lid and allow to stand for 10 minutes. Then tip the rice onto a large flat clean tray. A metallic is probably best as it will help the rice cool down quicker. Dress the rice with the mirin, turning frequently as this helps the rice to cool. Then fan with a fan or a magazine until the rice is room temperature (not essential but quite authentic). 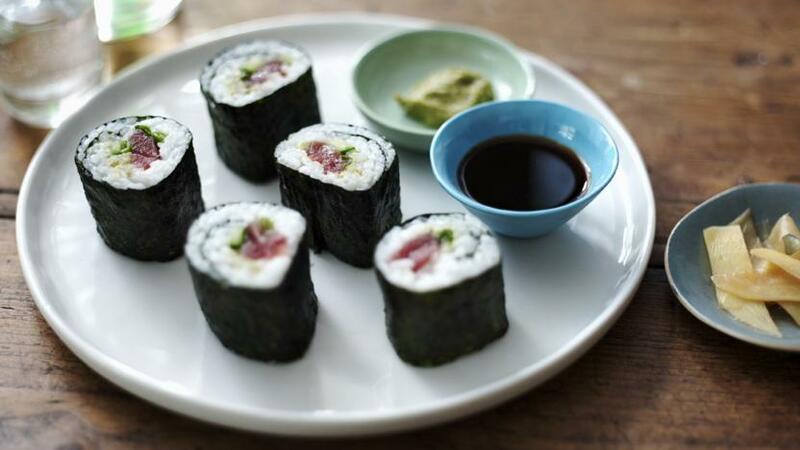 To make the sushi take a Japanese bamboo sushi mat and place a sheet of seaweed on top. Have a small bowl of water to hand. Dip your fingers in the water before you touch the rice. Spread the rice over three quarters of the seaweed, take a little rice at a time and push it to the edges leaving a layer about ½ cm thick. Leave the quarter the furthest away from you plain. Next smear a little wasabi in a line a little off centre nearest to your body. Follow with a layer of tuna, a spring onion and a piece of cucumber. Roll up the bamboo mat slowly, tucking in the closer end of the sushi roll to start a roll and press lightly with both hands. Remove the roll from the mat and leave to sit with the joining edges downwards. You can wrap in cling film and keep in a cool place until you are ready to serve. Don't place in the fridge as this dries out the rice. To serve, using a lightly moistened sharp knife to trim the ends, then cut into 6-8 pieces. Serve with the pickled ginger and little bowls of soy sauce.